The ActiViz product family provides a powerful interface to the Visualization Toolkit (VTK), an object-oriented interface encompassing thousands of algorithms which transform data into interactive 3D environments. ActiViz comes in two flavors: .NET and COM. ActiViz .NET provides developers the power of VTK plus the many .NET framework objects for web and database access, allowing for the quick creation of production-ready, interactive 3D applications in the .NET environment. COM users are able to embed VTK’s 3D graphics, image processing, volume rendering and visualizations into any Windows application supporting embeddable controls. 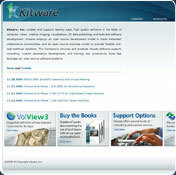 ActiViz .NET enables users to build WinForm applications. Using IntelliSense developers can write code in the supported .NET languages very rapidly. Combine data visualization and 3D graphics capabilities with the many web and database objects accessible in the .NET framework. The ability to embed 3D VTK visualizations within Microsoft Office documents is one of the inherent benefits of ActiViz/COM. Using ActiViz/COM is the only easy way to write a VTK based application using only Visual Basic. Along with the ability to embed 3D VTK visualizations, is the ability to write VTK programs from any COM compatible language. ActiViz COM consists of an ActiveX control class (vtkRenderWindowControl) and ActiveX class implementations of all wrappable VTK classes. The vtkRenderWindowControl class can be inserted into documents. It contains a vtkRenderWindow, as found in the VTK C++ class library. It provides some simple mouse and keyboard event handling to control the camera, provides access to the renderer, and manages the resizing of the 3D rendering window. The other VTK classes may also be instantiated from code, giving you full ActiveX/COM access to the entire VTK library of over 1300 classes. This means you have access to the hundreds of VTK algorithms supporting 3D graphics, visualization, computational geometry, image processing, file interface, and volume rendering. You cannot download any crack or serial number for ActiViz on this page. Every software that you are able to download on our site is legal. There is no crack, serial number, hack or activation key for ActiViz present here. Our collection also doesn't contain any keygens, because keygen programs are being used in illegal ways which we do not support. All software that you can find here is freely downloadable and legal. ActiViz installation package is prepared to be downloaded from our fast download servers. It is checked for possible viruses and is proven to be 100% clean and safe. Various leading antiviruses have been used to test ActiViz, if it contains any viruses. No infections have been found and downloading ActiViz is completelly problem free because of that reason. Our experts on malware detection tested ActiViz with various spyware and malware detection programs, including fyxm.net custom malware and spyware detection, and absolutelly no malware or spyware was found in ActiViz. All software that you can find on our servers, including ActiViz, is either freeware, shareware or open-source, some of the software packages are demo, trial or patch versions and if possible (public domain licence), we also host official full versions of software. Because we want to be one of the fastest download sites on the web, we host all the software including ActiViz on our servers. You cannot find here any torrents or download links that would lead you to dangerous sites.